I take pride in the fact that my girls have good imaginations. Nola(7) and Violet(5) don’t need a giant room full of toys to entertain themselves, not that they would be opposed to such an arrangement. When we send them outside they take toys and such, but often they will pilfer our suburban habitat for their imaginative purposes. Branches, rocks, grass, leaves, dirt, the perennial flowers I work very hard to keep growing (dandelions), all props in countless plays and pretend scenarios. The beauty is that they can turn grass and branches into nests for their stuffed animals. They can turn rocks into currency or dragon’s eggs. They can turn dandelions into thousands of wishes that float through the air—and if you wished to create a thousand more dandelions then ye shall believe in the power of magic. The un-beauty of this is that they don’t return all this nature. It lays in my yard, or on my drive and walkways. We have river rock landscaping sections in our front yard, and these stones are the chiefest of offenders. The front yard is peppered with them. My carpet of sod looks like the backstop to a shotgun shooting range. I’m not sure why my girls need so many rocks for their games and scenarios, but they must. With mowing season ramping up it is important to get those all picked up. It is equally important for me to not have to pick them up. Last week I suggested to the girls that I would pay them to put all the rocks back in their rightful areas. Now I could have just made them because, what has two thumbs and is their parent? This guy. But I wanted it done sooner than later. I wanted them to be motivated to pick up as many as they could and not just phone it in. So I outlined a compensation plan and it was brilliant. I surveyed the yard and felt there was about fifteen pounds of rocks scattered about. I told them I’d give them $5 each as a base. Then I’d pay them a dollar per pound for all the rocks they picked up. The $5 base was meant to hook them initially, the per pound was meant to motivate them. Visions of the Target dollar spot flashed behind their eyes as they each nodded eagerly in agreement with the terms. I handed them both a flathead screwdriver so they could unearth the portion of rocks that had been embedded in the ground. 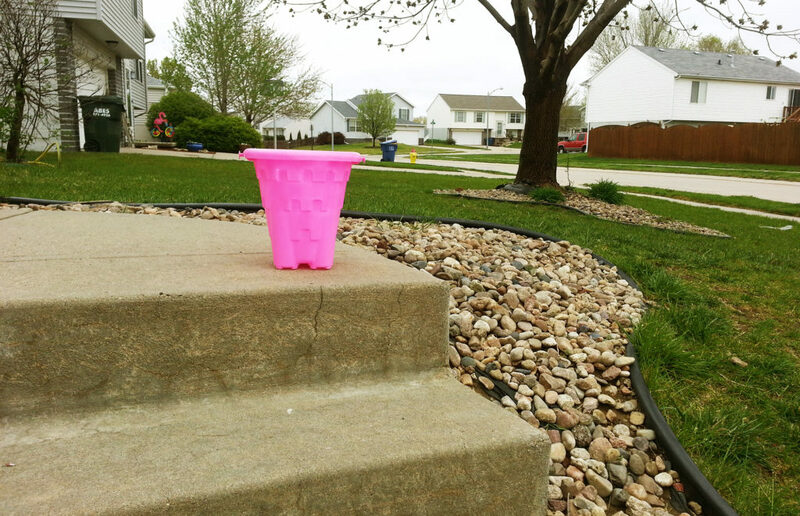 They found a little pink sand pail to fill and marched out to the front yard, the prospect of fair pay pepping their step. The pail was not very large, probably held 3-4 pounds, which was good because I wanted them to be able to carry it themselves. Eight minutes after I sent them out they step back into the house ready for their first weigh-in. I grabbed the scale from our bathroom and set it down by the front door. I looked out the window and they had barely scratched the surface thus far. Good, it will keep them busy for much of the morning. Bonus! I set the tiny, pink sand pail on the scale. The girls crowded the digital readout, smiling like it would actually print the money right there. They were so cute. I looked down. All of sudden they weren’t that cute anymore. Nola jumped in the air celebrating that, so far, they are making $127.50 per hour. I did not jump in the air but rather, chose to violently choke on my own spit. After regaining my composure I patted them on the back and, without a word, sent them back out to keep working. Then I sat down on our stairs and searched for any loophole that I could find in this arrangement. It was airtight. I toured the house to see what was worth selling. They kept a steady stream of full pails flowing to the scale and I kept the ever-growing tally. Each weigh-in a painful reminder of the pitfalls of rash estimation. Finally they said they were done. I jumped on that as fast as I could and closed the arrangement. Any more rocks found and put back would be on a volunteer basis only, or an executive order by me without pay. They skipped off to dump the last pail and I pulled out my scientific calculator to help with the upper level math I had to do. They pulled 77 pounds of river rock from my yard. Plop on a $5 base (2x) and I owed them $87. To fix a problem THEY created! This was a far cry from the $20-25 I originally estimated. I had to pay them though. We had a verbal contract, and they could take me to court. And let’s be honest, there isn’t a judge on earth that wouldn’t award money to these two doe-eyed, little plaintiffs. I decided that being a dad-of-his-word was worth $87. I sighed and looked into the future. I saw a dreaded trip to the Target dollar spot, which is their favorite place to go. I saw the subsequent drive home with our van’s bumper scraping the road under the weight of 87 of the world’s crappiest toys. I saw the river rocks that once littered my yard replaced with 87 cheap, plastic knickknacks that would have more use in a landfill. I saw the end of my days. Fortunately for me, well, for all of us, we were headed out of town that weekend to see Charity’s family in Missouri and I had an idea. They swaggered back into the house, palms upward and waiting to be filled with more dollar bills than they’ve ever seen stacked on top of each other. I told them that I didn’t have that kind of scratch on me. Then they asked why I called money “scratch”, and I told them all the cool kids say that. At least all the kids that want to be cool decades ago. Their eyes grew wide and before I could finish they were jumping and screaming, “YES! We want the hotel!” Then I grabbed their hands and we all danced in a circle shouting, “YES! We want the hotel!! !” We finally stopped to catch our breath and I wiped grateful tears from my eyes. The hotel was a little more expensive than $87 but worth every penny. It was something the whole family could enjoy and experience and, more importantly, it kept a mound of worthless toys from crowding my house. I was proud of my girls. I doubt they were consciously doing it, but ultimately they chose to make a memory over stockpiling product. To invest in experience instead of extruded plastic. And it was totally worth it. My yard looks amazing though. It is embarrassing how hard I am laughing in the hotel breakfast bar while reading this. And I WISH I had KNOWN the girls bought that hotel room. Oh, man! I would have made the most of that information on your visit. Erica and I are in tears laughing over breakfast. She started reading and doing that crying – laughing thing so I stopped and had to join in!!! I love your mind Ryan… It’s brilliant!! Thank you for making the memory for us also! Such a good read. I think Nola said they ran out of rocks in your yard so they went and scooped up a pail or two of the neighbors river rock. I could be mistaken though. Ah, Ryan. Couldn’t the scale have suddenly and inexplicably broken? I guess being a Dad of his word is worth it 🙂 Great write up! This crossed my mind. I also toyed with telling them that I was paying them in Yen. Would have been about $0.80. This is fantastic! Way to go for being willing to keep your word even though it would have cost way more than you were thinking. And what amazing girls to do all of that work cheerfully & then still choose the hotel for the whole family! They are such sweethearts! Also, who knew little rocks could be so heavy?! So funny! I think this is my favorite blogspot so far! Hilarious! What a gift these blogs will be in their future. So so great. Your family is amazing. And seriously, you saved yourself from a bunch of plastic junk! Thank you for sharing.. Keeping us from any deal we are not able to pay.. Cause we are trying to come up with one ourselves.. Those scratch money do add up quick.. Good laught and memories.. I had a co worker blow a river rock through her windshield while cutting her grass. I think you saved money!!! Okay, this had me laughing so hard at this. I need to stop reading your blog or I’ll get nothing more done today at work! You don’t even know how inspiring this is for me. No kids of my own yet, but I look up to you as an example of how to father. I love the humility, and $87 turned into an awesome hotel stay. And I’m super proud of those girls. At $127.50 per hour?! I want to move into your house! You did move me to hilarious laughter, and every tidbit of this blog was delicious. But like good Chinese food, you’ve left me hungry for more. Please get back to writing. Ha! This is the first time my writing has been compared to good Chinese food. And I couldn’t be happier for it. Thanks for the encouragement! I plan to get back in the writing groove.